Wilmington, N.C. – Oct. 16, 2018 – Wilmington and Island Beaches, N.C., is open for business once again following Hurricane Florence. Most area attractions, restaurants, retailers and other businesses in Wilmington, Carolina Beach, Kure Beach and Wrightsville Beach are open and eager to welcome visitors. In addition, many hotels and other accommodations are now open for future travel planning and reservations following the storm. Officials are continuing to assess the full impact to the area from Hurricane Florence. According to county officials, a preliminary private property damage assessment shows $450 million worth of damage countywide – a number that is likely to rise as more people assess their damage. “Our coastal community has a long history of persevering. We have already seen much progress with respect to recovery. 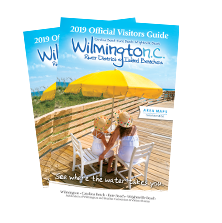 On behalf of the entire Wilmington and Island Beaches area, we are ready for visitors to start making plans to experience our charming southern hospitality once again,” said Wilmington Mayor Bill Saffo. Many of the area’s signature attractions and iconic structures were fortunate to experience minimal damage from the storm, including the Riverwalk, Battleship NORTH CAROLINA, Carolina Beach Boardwalk, North Carolina Aquarium at Fort Fisher, Kure Beach Fishing Pier and Johnnie Mercer’s Pier at Wrightsville Beach. According to LeAnn Pierce, Council Member and Mayor Pro Tem for Carolina Beach, there are still a few businesses recovering from the storm, but most are up and running. She is thankful for the support they have received from around the state and the country and is looking forward to welcoming visitors back to the island. Wilmington and Island Beaches is heavily reliant on tourism and supports over 6,300 jobs. According to an annual study, the county-wide economic impact from domestic travel for 2017 in New Hanover County was estimated at more than $587 million. New Hanover is ranked as No. 8 among North Carolina’s 100 counties in tourism expenditures. According to Hufham, one of the biggest ways visitors can support the area is by planning a future visit. Upcoming events like the Pleasure Island Surf Fishing Challenge (Oct. 19-21), Oysterberfest (Oct. 20), Lighthouse Wine & Beer Festival (Oct. 27), Riverfest (Nov. 17-18), and a variety of other fall festivals and Halloween happenings ensure plenty to see and do during an upcoming trip. Visitors are encouraged to call accommodations and attractions in advance to confirm availability prior to their trips. They can find updates on what they can expect as they are planning their fall trips to the area by visiting the CVB’s storm recovery pages: Wilmington and Island Beaches, Carolina Beach, Kure Beach and Wrightsville Beach.